Hope everyone is enjoying their Easter and in commemoration of this season, we've decided to share this recipe of Hot Cross Cookies (instead of the traditional Easter Hot Cross Buns ^_^) Here at Amari Quickbreads Bakery, we're a bakery in Nairobi that loves variety, so we've decided to change the tradition this time and share this cookie recipe. Hope you love it. 1.) Preheat oven to 375 ºF, then grease and flour a baking sheet. In a large bowl, cream margarine, sugar and eggs until smooth. Sift in flour, cinnamon and baking powder in a separate bowl. Add the dry ingredients slowly to make a dough. Fold in the sultanas and 100gm of white chocolate. 2.) Roll lumps of dough into balls the size of golf balls. Flatten these onto the baking sheet and leave a small space between each of them for expansion. 3.) Bake for 10 minutes or until golden brown. Remove the cookies from the trays and cool on a cooling rack. 4.) Melt remaining white or dark chocolate in a microwave for a few minutes or using a double boiler. 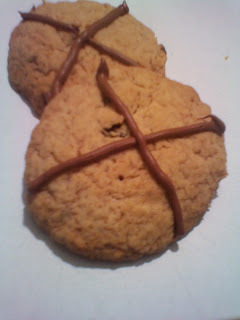 Using a piping bag or a teaspoon, drizzle a cross on top of each cookie. Leave to set before serving the cookies. These cookies can be stored in a cookie jar or container for upto 3 days. 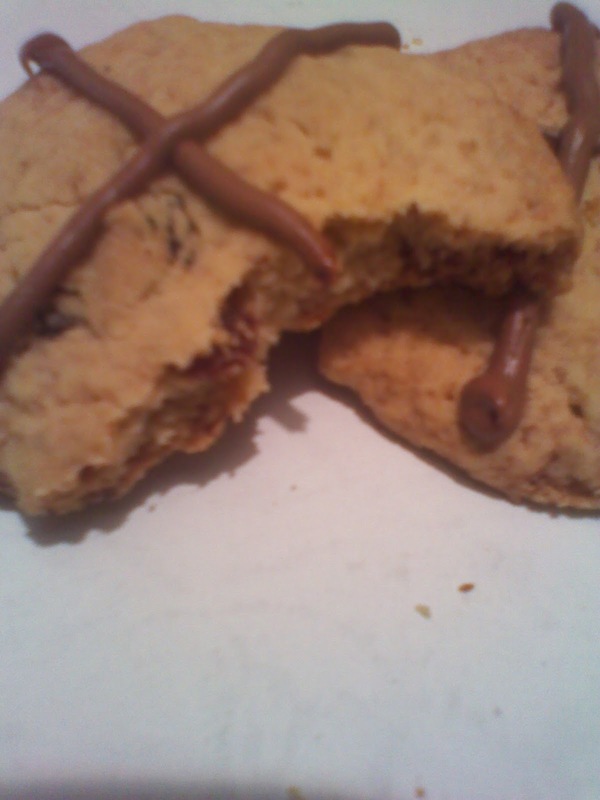 ﻿﻿﻿﻿﻿ Enjoy the cookies and have a great Easter season ^_^!